I welcome the publication of a report by Oxfam and Church Action on Poverty on foodbanks entitled Walking the Breadline. The report states that food poverty is out of control in the UK and that half a million people are dependent on emergency food aid. The single biggest cause of hunger is the benefit system. The report recommends that the House of Commons Work and Pensions Select Committee conduct an urgent inquiry into the relationship between benefit delay, error or sanctions, welfare reform changes and the growth of food poverty. I have visited the Dundee Foodbank and I know that the staff and volunteers at the Dundee Foodbank do an excellent job. They have my full support in their work at this time. I have supported my colleague Councillor Kevin Keenan who was successful in getting funding for the Common Good Fund for the Foodbank. The Foodbank is used by people from across the city including in my ward and I cannot praise the work of the staff and volunteers enough, however it is a disgrace that in 2013 a Foodbank is required in Dundee. I welcome the report from Church Action on Poverty and Oxfam and I support their call for action. I think that the House of Commons Work and Pensions Select Committee should carry out an inquiry into the link between the way the benefits system works and the use of Foodbanks. I also think that Dundee City Council should be recording when it refers people to the Foodbank and look at the reasons for that referral. I will be asking the council to collect this information. I also agree with the final recommendation of the report that the UK Government must do all it can to tackle tax dodging as this would return more money to the government and allow the government to offer better support for people. Please email your MP to asking them to support the recommendations made in the report. I support the work of Foodbanks and especially the Dundee Foodbank but we must surely be working for a day when such aid is not required. 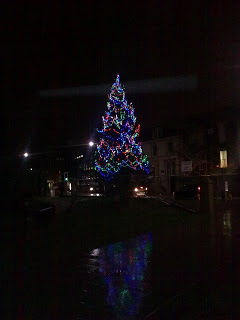 On Wednesday I attended the first meeting of the year to help with the planning of the West End Christmas Fortnight. It is never too early to plan for Christmas! The West End Christmas festivities are a great community event involving the local schools, the local community and many others. I look forward to working with others to help celebrate Christmas in the West End this year. On Wednesday I was delighted to attend the Dundee Picture Book Award Ceremony for 2013. This is a great award which is decided by a combination of Primary Six and Primary One pupils in the city. It is important to promote reading in the city. The ceremony on Wednesday was hosted by Hillside Primary School and they did a great job hosting the ceremony. Each of the books was read at the event and they were all excellent. The winner was a book called Orange Juice Peas by Lari Don, illustrated by Lizzie Wells. It must have been a close run contest but well done to the winner. You can see the video above of Lari Don reading her book. The other books in the running were Christopher's Caterpillars by Charlotte Middleton, Silly Doggy! by Adam Stower and Love Monster by Rachael Bright. Well done to the staff of Leisure and Culture Dundee and the City Council's Education Department for their work on this award. On Tuesday evening I attended a meeting of the Board of Dundee Rep. As ever it was good to hear about the great work which is going on at the Rep. Kora is currently on at the Rep and in June there is a National Theatre of Scotland production called Let the Right One In. The productions on the main stage are just a part of the Rep's work. I was pleased to point out that I had recently attended a production in the Inspire programme. This production by primary school pupils who work with the Rep's Creative Learning Department is a great way to interest young people in the theatre. It was also good to hear about the work that Scottish Dance Theatre were doing. Dundee Rep is a great resource for the city and it also does a great deal of work to promote Dundee outside of the city.